Even though my reread of JSA has stalled (I’m still working on it) I still wanted to write about some comics. My first instinct was to write about Final Crisis, possibly my favorite big superhero crossover. It has long been on my list of things to write about and it is in my mind right now having just read Multiversity. Unfortunately, I don’t know that I have anything to add to the conversation about Final Crisis, a conversation that has been over for a few years anyway. My next instinct was to write about the Giffen/DeMatteis and Maguire Justice League International, another longtime favorite. I got started looking through that and decided what I wanted to write about it, but what stood out to me was a pair of characters that have a sizable following but aren’t ones that jump to my mind when thinking of that book: Mr. Miracle and Big Barda. They, or at least Mr. Miracle, were longtime members of the team, but characters like Blue Beetle, Booster Gold and Guy Gardner tend to be the ones that take the spotlight. 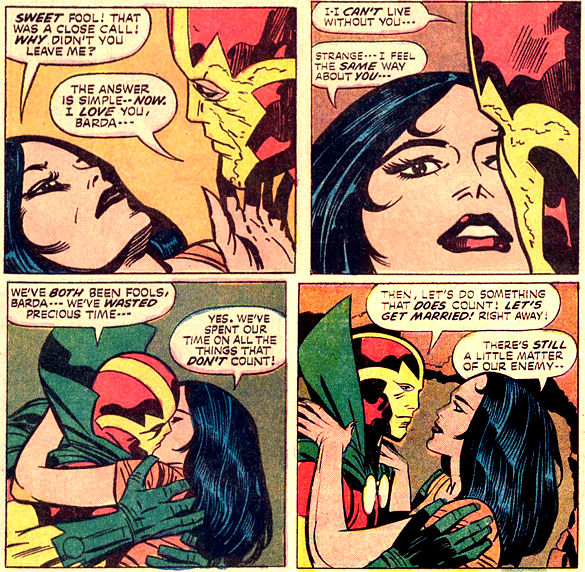 Fortunately, Miracle and Barda have plenty of other comics where they did star. The best, of course, are Jack Kirby’s own Mr. Miracle comic from the 70’s, but they were popular guest stars and got a spin-off from JLI. Mr. Miracle was one of the comics that come out of Jack Kirby’s ambitious Fourth World project. Mr. Miracle, real name Scott Free, was the son of the Highfather, given to Darkseid in exchange for Darkseid’s son, Orion. Thrown into the villainous Granny Goodness’ orphanage, he escaped to Earth, where he became an escape artist. That is his super power, the ability to escape any trap. In issue 4, Kirby introduced Big Barda, the leader of Granny’s Female Furies. She was trained from birth to be a warrior, but Scott’s refusal to bow to Granny inspired her to forsake Darkseid’s evil forces and join him. Together they forged an unforgettable bond. There is just something so perfect about them. While Scott is a capable fighter, that is never his first inclination. Barda, though, is a trained warrior and tends to push violently through all of her problems. It is a great contrast. Their methods may be wholly different, but they are tied together by their love for each other (Read this Ask Chris, since he says everything about this I want to say better than I do). Having escaped from Apocalypse and reached Earth, Scott and Barda’s goal is merely to have a normal life; a normal life as a couple in Middle America. It is equally heartwarming and impossible. Impossible because they can never truly have that normal life as long as they are who they are and are appearing in a superhero comic book. The original Jack Kirby stuff is as great as one would expect from Jack Kirby. Mr. Miracle is still working as an escape artist at that time, and Barda’s part in the act, usually setting up the heavy equipment that is going to be used to potentially squash Scott, draws a lot of attention. Then there are her reactions to his escapes, where she and Oberon, Scott’s assistant, both react as though they just watched Scott die each and every time. At the end of that series, the two of them are married and they largely disappear for a decade. That desire for a “normal” life is a big part of their motivation in the late 80’s JLI. By that time, they have created a life for themselves in the suburbs. While Barda stays home to unconvincingly play homemaker, Scott joins the Justice League as his day job. The two threads of his life constantly bleed together, of course. The best bit might be in JLI Annual 2, where the Frees host a barbeque for the Justice League. Most of the issue is just the various members of the team getting to trouble trying to get to the party, with the Joker escaping from Arkham and stealing a tank just adding to the confusion. Scott, meanwhile, spends the issue trying to get the grill set up while Barda frets violently around the house, trying to get lunch ready to cook as soon as the grill is operational. It is a perfect shot of skewed domesticity. These two are a perfect pair, so much that one appearing without the other seems like a waste. Each of their appearances is to be treasured. The episodes they appear on in Justice League Unlimited and Batman: The Brave and the Bold are a lot of fun. Mr. Miracle has appeared recently in Justice League, one can only hope that Barda is not far behind.